You have a small to mid-sized business and you’d love some help. 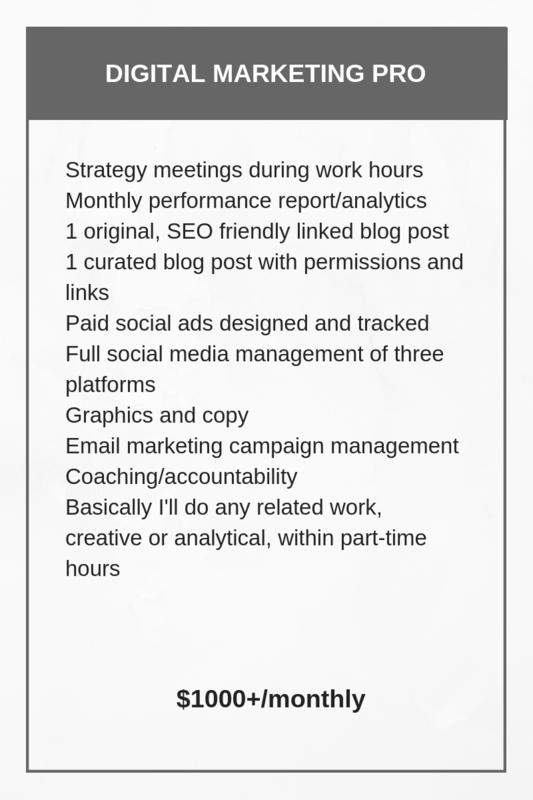 Perhaps you’re not sure what digital services you need exactly, but you know you’d like an assistant with a good head for strategy that’s easy to work with and has experience. That’s perfect because we start off with you looking at my pricing facts below and then completing my simple questionnaire. In order to give an estimate and come up with a working strategy, I really have to learn more about your business and your customers. Then, I make custom priced package rates based on an understanding of the age and level of your business and the ROI's that are expected. When your business is healthy “you” don’t pay me, your sales and new customers or clients do! The Deep Dive. This is my absolute favorite way to work. I am not a halfway kind of person. I prefer to dedicate myself to as few clients as possible and learn your business inside and out. I get to use all of my skills and loving care on managing whatever aspects of your marketing that I’m capable of. I’m also happy to learn new tools and skills, so if you don’t see something listed, ask me about it! This best retainer service or employee-ship begins at $2000 a month. 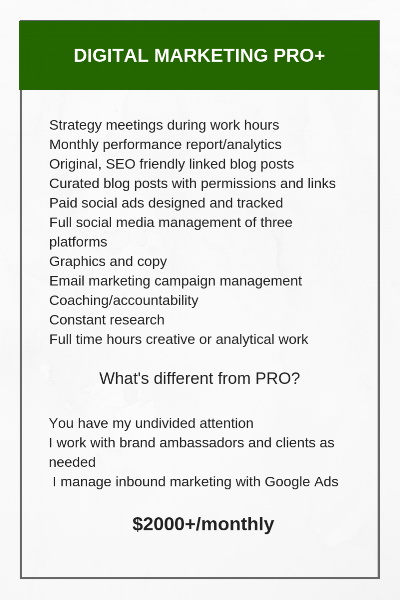 Full-service digital marketing partner and content/ad creator and manager rates run from $1000 to $3000 a month and can encompass a variety of skills and responsibilities. Full website build (more pages) $1200-2000 includes basic hookups to email server and 3 social channels plus necessary apps. For example, if you run a restaurant, we find a template that suits you and we hook up a take out or menu app. Email set-up and management $500 monthly. This includes setting up automation/drip, lists, segments, tags. If you’re at the start of a business venture and don’t know where to begin, feel free to download my 20 page guide to digital marketing. 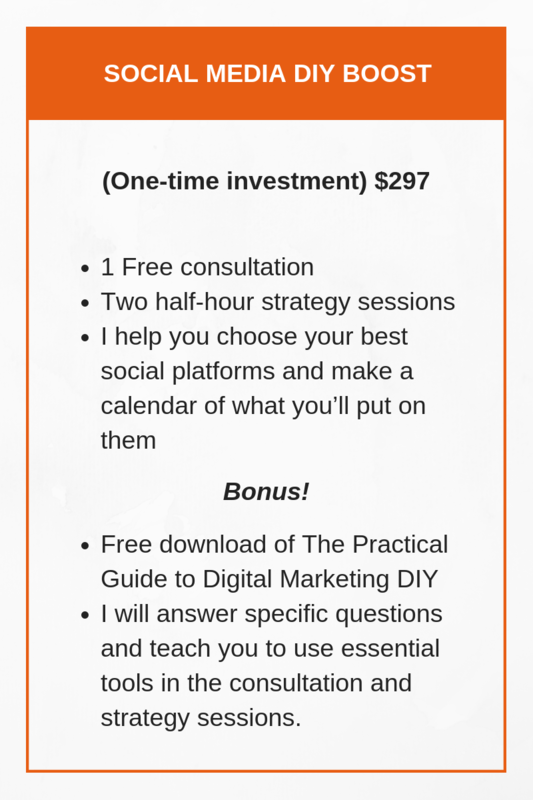 If you skim it and think you might like to talk to me and get a little personalized support in organizing and getting started on your own, download the Do-It-Yourself Digital Marketing Start Package and let me know you’d like to talk.